South African Olympic and Paralympic track star Oscar Pistorius, commonly known as the "Blade Runner", was arrested on Thursday after his girlfriend was shot dead at his home in Pretoria, police and domestic media said. Police declined to name 26-year-old Pistorius as the suspect but confirmed that a woman had been found dead at the scene in the upmarket Silver Woods gated community east of the capital. "We found a 9 millimetre pistol at the scene. A 26-year-old man was taken into custody," police spokewoman Katlego Mogale told Reuters. She declined to give any further details. Johannesburg's Talk Radio 702 said Pistorius was understood to have shot his girlfriend in the head and arm, although the circumstances surrounding the incident were unclear. He may have mistaken her for a burglar, the radio report said. 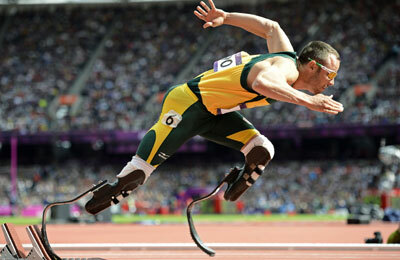 Pistorius, who races wearing carbon fibre prosthetic blades after he was born without a fibula in both legs, was the first double amputee to run in the Olympics and reached the 400 metre semi-finals in London 2012. However, things did not go smoothly in the Paralympics with Pistorius suffering his first loss over 200 metres in nine years. After the race, he sullied his media darling persona by questioning the legitimacy of Brazilian winner Alan Oliveira's prosthetic blades. The comments sparked controversy though Pistorius was quick to express his regret, going on to describe 100 metres champion Jonnie Peacock of Britain as a "great Paralympic sprinter". South Africa has some of the world's highest rates of violent crime and some home-owners carry weapons to defend themselves against intruders.